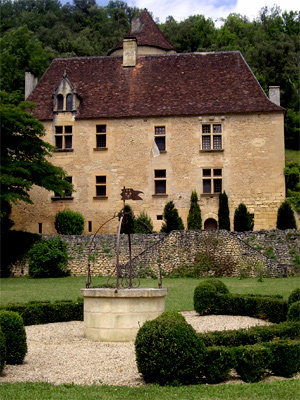 The Medieval Château de Roucaudou (15th - 17th century) is located in the center of Périgord Noir (Black Perigord), at the outskirts of the historic old town of Les Eyzies (capital of prehistory). The château was once home to the famous French philosopher and writer Jean de la Bruyère. Now, restored with care, the château and the cottages offer an unforgettable vacation. The rest and relaxation, the magnificent natural environment, and the multitude of recreational activities makes an adventure of each day. The Château de Roucaudou offers two unique cottages, La Colombine and Les Vignes, and two apartments in a Perigord style house, La Marguerite and Les Pins, to choose from. Each place is fully furnished and comes equipped with a full kitchen, satellite television, linens, patio furniture, and heating. A seperate laundry facility with two washing machines, a clothes dryer, ice machine, and ironing equipment is also available. To book a reservation to stay in a cottage at Château de Roucaudou, please click here and select the cottage you wish to stay in, during an available week, and fill out the information on the reservation request form. A representative will contact you with additional information about completing the reservation. Please note that the minimum stay for all cottages is one week. There are many exciting and fun-filled activities to enjoy while staying at Château de Roucaudou. Horseback riding, hiking, canoeing, wine tasting, bicycle riding through the beautiful French countryside, and touring the ancient city and the prehistoric painted caves of Les Eyzies are just a few of the many things to do during your visit. Click here for more exciting activities.